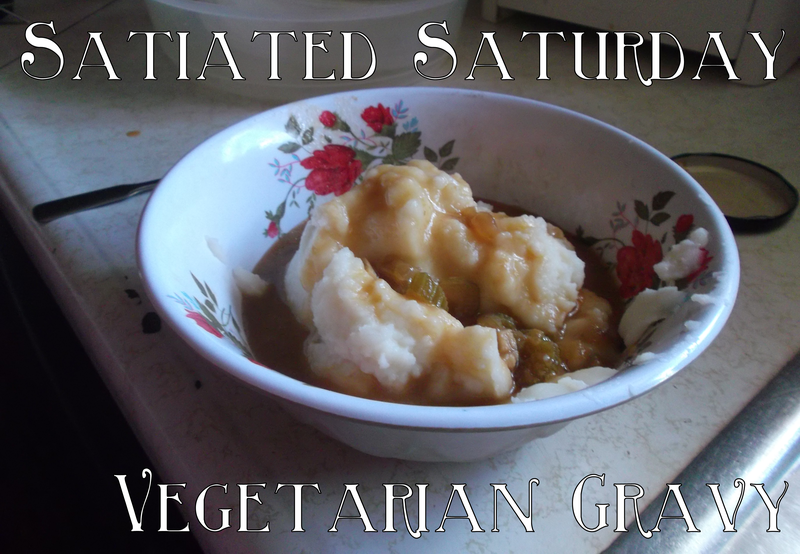 I know it’s been a while, but just in time for Thanksgiving, I’ve created a vegetarian gravy recipe for you. I referenced two gravy recipes (this and this) but didn’t particularly follow either one. Also, I don’t have many photos because I wasn’t planning to put it up when I made it. I used: about 2 tbs vegetable oil, ⅓ cup chopped white onion, 3 cloves minced garlic, approximately ⅓ cup flour, 2 ½ cups vegetable stock, ½ cup water, and 1 stalk chopped celery. Next prepare your ingredients. I didn’t do this while I was cooking, but you should prep the ingredients before you start cooking, because it will make things easier. So chop your onions and celery, mince your garlic, measure your oil, stock, and water, and then mix your stock and water together. This helps to temper the strong flavor of vegetable stock by itself. The celery is optional, and make sure to chop it to a size you can handle in the gravy. Now you’re ready to heat your medium sized pot and your vegetable oil. I put it on high until it got hot, then lowered it to medium for the rest of the cooking time. Give it a minute or two to heat up, then add your onions. You want to cook them until they’re pretty translucent, which will be about five minutes. Midway through cooking your onions, add your minced garlic. You don’t want to add it too early or it will burn. Use your best judgment, I trust you. (This is also what my boss said when she entrusted me with judging a comp membership request at the museum. Have I mentioned that I intern at the Missouri History Museum? Cause I never stop thinking about it). When the onions are translucent, add your flour. This is not an exact science so add it little by little until it forms a paste-like consistency. This will keep your gravy from being too runny. And remember, you can always add more later. Now that it’s a paste, completely ruin that texture by adding your stock and water. Stir that together, then add your chopped celery. The celery is optional, but I quite like celery. 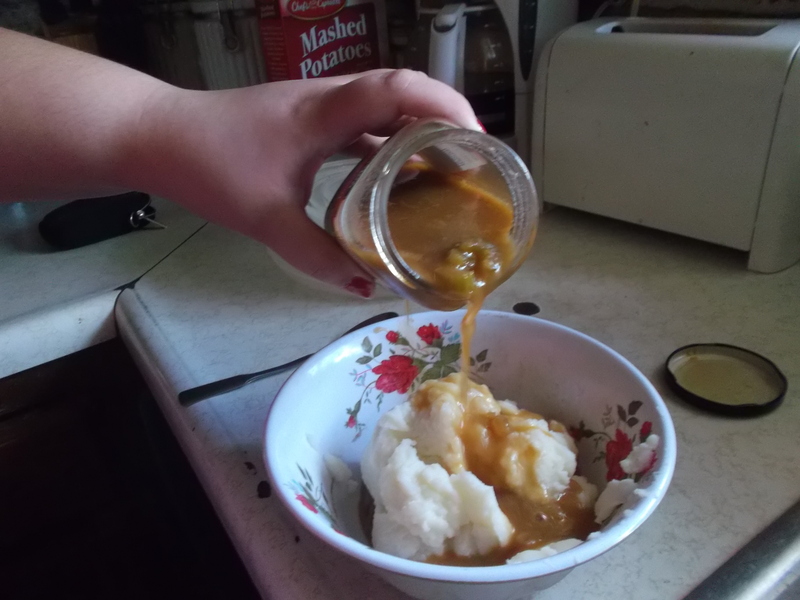 Allow your gravy to simmer for about 40 minutes. If it starts to boil turn the heat down. When it’s ready you can strain out the celery, garlic, and onions, or leave them in. I left them in for extra flavor. I fed this to my carnivore mom, and she couldn’t tell it was vegetarian. It’s delicious over mashed potatoes, and I think it would be good with a veggie loaf too. I hope you enjoy it as much as I do. Not entirely unrelated: I recently posted a video about the holiday season and how it’s not all Hallmark cards and sappy movies for everyone. You should check it out.